Nearly 5 million Americans, or more than 2 percent of the population, follow some form of a vegetarian diet. Although you might miss eating meat when you start a vegetarian diet, the benefits of vegetarianism can outweigh the disadvantages. Being aware of the pros and cons of being a vegetarian can help you make the healthiest decisions if you try to follow one. When contemplating the pros and cons of vegetarianism, consider the different dietary patterns that may influence your decision. Lacto-ovo-vegetarians, which is the most common, do not eat meat, poultry or fish but eat both dairy products and eggs. Lacto-vegetarians do not eat meat, poultry, fish or eggs but do consume dairy products. Ovo-vegetarians eat eggs but not meat, poultry, fish or dairy products. Vegans do not eat dairy, eggs or any products which are derived from fish or animals, explains Harvard Health. People who follow vegetarian-style eating patterns are less likely to become obese than individuals who do not follow such patterns. This may be partly the result of higher consumption of lower-calorie, more filling foods, such as vegetables, fruit and beans. According to a study in The Journal of the American Medical Association in 2018, the obesity rate of Americans is on the rise, with an increase from 33.7 percent to 39.6 percent since 2007. Obesity is a risk factor for cardiovascular disease, high blood pressure, type-2 diabetes and some types of cancer. Vegetarian diets that eliminate high-calorie foods, such as fatty meats, butter and full-fat cheeses, can result in a diet that is lower in calories. A downside of being a vegetarian is the extra effort you will need to make sure your diet contains all the vitamins and minerals needed for good health. A well-planned vegetarian diet can be adequate in protein and essential nutrients, but vitamin B-12 is primarily obtained by animal-based foods, such as meat, poultry, fish, eggs and dairy products. According to a publication in the Permanente Journal in 2013, vitamin B-12 deficiency can put you at risk for macrocytic anemia and irreversible nerve damage. Most vegetarian diets need to obtain vitamin B-12 from fortified foods or supplements, such as fortified orange juice, soy milk and yogurts, yeast extracts and margarine, according to the Vegetarian Society. Vegetarians can also find themselves deficient in omega-3 fats found in fatty fish, which may manifest as skin, hair, and nail abnormalities, warns the Nutritional Update for Physicians, published in the Permanente Journal. Walnuts and flaxseed contain omega-3 fatty acids, but supplements can also provide additional heart-healthy benefits to make up for the lack of fish and seafood in the diet. Read More: How Much Vitamin B-12 Should I Take Daily? Compared with omnivorous diets, a varied vegetarian diet contains less saturated fatty acids, and cholesterol (found in animal-based proteins) and more vitamins C and E, potassium, magnesium, fiber, folate, antioxidants, phytochemicals and carotenoids (found in fruits and vegetables). As a result, potential health benefits include a lower risk for cardiovascular disease, lower blood pressure and a longer life expectancy. A report to update the role of plant-based diets, used the Lyon Diet Heart Study as one of the studies analysed. The results of that study found that vegetarians, whose diet included plant foods, vegetables, fruits, and fish, experienced a 73 percent decrease in cardiovascular disease and a 70 percent decrease in coronary-related mortality compared to the control group. The update, published in Permanente Journal in 2013, encouraged doctors to put their focus of preventing and treating disease, not on a pill, but on another serving of vegetables and fruits. 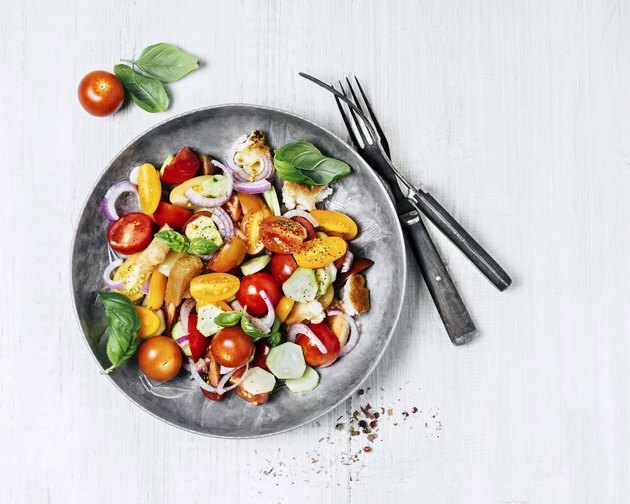 The pros and cons of a vegan diet may favor the vegan diet in a cohort study conducted to compare the effects of vegetarian, vegan and lacto-ovo-vegetarian diets, and non-vegetarian diets on overall health. Results, published in the journal Nutrients in 2014, found that vegetarians had a lower risk of diabetes, heart disease or stroke and some cancers than the non-vegetarian group. Vegan diets offered additional protection against obesity and cardiovascular mortality compared to lacto-ovo vegetarian diets. Despite the potential health benefits of vegetarian diets, these results are not automatic. They are more likely when you mainly choose healthy foods, such as whole grains, fruits, vegetables, nuts, beans and seeds. Vegetarian diets that rely on refined grains, sweets, sugar-sweetened beverages and solid fats can be just as unhealthy as diets that include meat. French fries, doughnuts and snack cakes, for example, are vegetarian, but they can contain dangerous trans fats, which raise your unhealthy LDL cholesterol and lower your levels of high-density lipoprotein, or "good" cholesterol. Vegetarian Society: What is a Vegetarian.